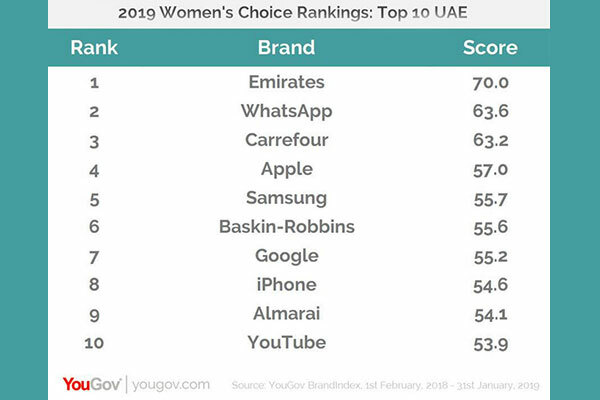 Dubai-based airline Emirates, Apple and WhatsApp are the top ranked brands by women in the UAE, Saudi Arabia and Egypt, respectively, according to the 2019 YouGov BrandIndex Women’s Choice Rankings. The rankings were compiled using the Impression score from YouGov’s daily brand tracker, BrandIndex, by asking respondents, “Which of the following brands do you generally have a positive/negative feeling about?” over the past 12 months. Emirates has dominated the rankings in the UAE since 2017 and continues to appeal to the women in the country. In Saudi Arabia, Apple replaces Almarai as the top brand among women. The launch of new iPhones and Apple watch last year generated a lot of noise for both Apple and its smartphone brand, and has boosted Impression among female consumers. Almarai, on the other hand, had a more difficult year with the backlash over a price increase, which also seems to have affected its perception among women in Saudi Arabia, pulling it down from first to fifth place this year. Amongst women in Egypt, the survey saw a strong resonance of chocolate and confectionary brands. Galaxy has improved its score over the past year and has landed in second, Kit Kat has moved up from eighth to sixth and Cadbury has made a re-entry into the rankings at eighth after dropping out of the list last year. The past year seems to have brought some ups and downs for technology brands in the region. While WhatsApp is the top brand in Egypt and remains second in the UAE, it has slipped down two places this year to fourth in Saudi Arabia. In the UAE, Google and YouTube have seen a fall in their scores, however, in Egypt they have moved up the list. Meanwhile, iPhone seems to have witnessed a decline in both Egypt and the UAE. YouGov also revealed the 10 brands that made the largest improvement to their Impression scores over the past 12 months. Coca-Cola is the most improved brand of past year among women in the UAE, with a change in score of +10.1. Mada and Heinz are the most improved brands in Saudi Arabia and Egypt, respectively, with an uplift in their Impression scores of +11.5 and +9.0, respectively. Netflix’s original content seems to be appealing to women in the UAE, driving up scores for the brand. Likewise, fast-food chains like KFC and McDonald’s have also registered marked improvement to their Impression scores this year.